I can say with 100% certainty that there is nothing at which I am an expert. There are, however, a few things of which I am incredibly passionate about. Orca whales are one of those things. While there are topics worth biting my tongue over, this is one passion I freely share my firm opinion on. The story of the whale trainer at SeaWorld in Orlando, Florida that was killed by a captured orca whale – more commonly known as the “killer whale” – has reached all corners of the globe since Wednesday afternoon’s tragedy. An event such as this one naturally triggers a landslide of questions. Perhaps the most commonly asked question is simply: how could this happen? Dawn Brancheau was an experienced trainer, having worked with these magnificent mammals for 16 years. The whale at the centre of this story is a 12,000 pound male named Tillicum, a creature that Dawn was incredibly familiar with and one whom she had created a working relationship with through training. So what provoked Tillicum to drag Dawn under the water and into an untimely and heart-rending death? The question of how this could have happened seems, to me, to have a rather simple reasoning. 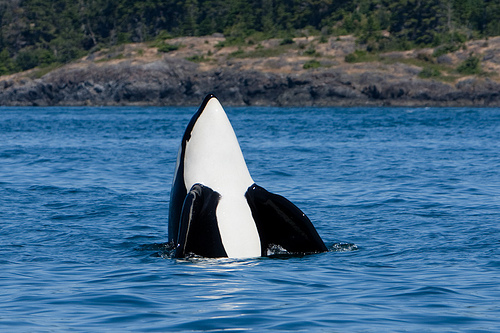 Orca whales, like any animal on this planet, is at its core a wild animal. No amount of domestication can ensure a human’s ultimate safety around animals – whether we’re dealing with whales and dolphins or cats and dogs. As an expert in her field, I have no doubt that Dawn was fully aware of the daily risks she took in working with Tillicum. While what happened is wholly unfortunate, at the end of the day it can’t be unexpected either. Many news reports that have come out in the wake of this event have suggested that it’s likely Tillicum simply thought of Dawn as a “toy” and was merely playing with her. Though defined as predatory, orca whales (which are actually a species of dolphin, not whale) aren’t generally thought to be a threat to humans and are, more often than not, peaceful creatures. That said, it can be contended that Tillicum was simply doing what comes naturally to him. If, on the other hand, what happened was rooted in aggression, we could consider his environment a chief contributing factor. Oceanic mammals were created with the sea as their home and playground. To pluck them from the deep blue and confine them to the equivalent of a bathtub will surely have an effect. Imagine, if you will, being contained in a single room, left to circle endlessly while people peered in through windows on all four sides. It would be enough to drive you mad, wouldn’t it? And so the great debate regarding whales in captivity has kicked up again and everyone is sure to have an opinion. Scientists claim that capturing whales is the best way by which to study them and learn of their nature and habits in order to assist in conservation programs. It would seem to me that the most effective environment to study whale behavior regarding conservation is in the wild. But then again, what do I know? I’m not an orca expert, just an orca lover. Contribute your two cents: Do you think keeping whales in captivity is an acceptable practice? Should they be released into the wild? Well said Keira, and totally agreed. Places like SeaWorld are nothing short of concentration camps. Not only are the animals jailed, but made to work for a living too. My heart goes out the trainer’s family, absolutely – but I don’t for a second blame the whale. Places like SeaWorld simply shouldn’t exist in my opinion, and I don’t buy the research argument for a second. What can we really learn about the natural behaviours of a whale from observing them in a fishbowl? In terms of release, though, Tillikum in particular has been in captivity for almost 20 years now. It’s hard to think that he could make it on his own in the wild, without a pod to belong to, any more that I could make it on my own if released into the forest… The question of what to do next is a tough one for sure. @Devon – I fully agree. Sadly, I don’t think Tillicum would stand a chance in the wild at this point. The title was simply a play on words. It would be ideal if further animals were unable to be held in captivity. I remember seeing Tillicum at Oak Bay Marina when I was a youngster! (same orca we’re talking about right?) Back then it was cool to see them like that, now that I am older/wiser/smarter whatever it amazes me that we keep these large mammals in such small enclosures. Yes I miss the days that the Vancouver Aquarium had orcas (and the polar bears too), but I am sad to see them in the enclosures be it SanDiego’s SeaWorld, Orlando or whatever. Doesn’t the Vancouver Aquarium hold what now…4/5 belugas in the same area roughly the same size? Alright so the male beluga is in another area that people can’t access, but still…. 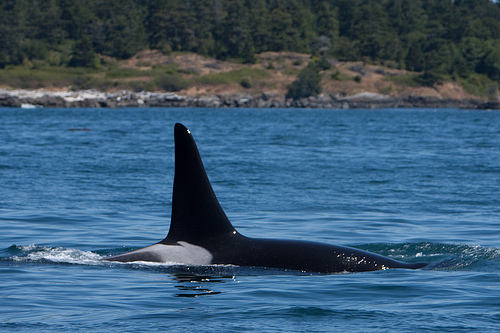 I LOVE seeing orcas in the wild (great photos above eh?) I also love seeing Gray and Humpback whales in the wild also. Nothing compares seeing these majestic creatures in their natural habitat. Not to be a nut, but technically Orcas are in the Dolphin family, not the Whale family right? @Tyler – See the fifth paragraph above. I’m quite biased concering the captivity of wild animals in general and orca whales specifically. On the one hand I think that for the people to understand the genuity and variety of animals and our planet one has to get “as close as possible”. And mostly this closeness can only be achieved by capturing animals and put them into installations like Seaworld or Zoos. But on the other hand I have to totally agree with the said above that keeping animals in zoos or Seaworld is like keeping the hostage which sooner or later makes everybody crazy. I don’t know if you remember Keiko, the whale that played Free Willy. They trained him to be able to return him into the wild. However, how much training they gave him, he would always return to places where lots of people were. He just couldn’t connect with his own species any more. I hate to think of all the animals in captivity pacing back and forth in their confines. They should all be free to live their lives as nature dictated. I do think that releasing the ones currently in zoos,aquariums and game farms would be a mistake. They probably wouldn’t survive. They aren’t called killer whales for nothing. It’s awful to hear about things like this, that poor woman. On the same token though, what kind of life is this orca living? What bothers me most is the fact that Sea World will probably be busier than ever with people wanting to see the “killer” whale. I don’t buy the argument that scientists claim capturing whales is the best way to study them. I agree that it seems far more effective to study them in their natural habitat. Fortunately there are organizations who do this, and who actually promote and conduct responsible research and conservation. I have no idea how much research is done at Sea World but I don’t get the impression it’s an accurate measure of a whale (or dolphin’s) natural behaviour. I’m pretty biased towards not keeping these mammals in captivity. I do understand the fascination people have with them (myself included) but just feel there are better ways to appreciate and learn about them than watching them cruise around in a big fishbowl doing tricks. I grew up on Van Island, and went to the Oak Bay Marina. The “tank” he was held in there was a disgrace. It was fed water straight from the ocean – grease from boats floated on the surface, etc. It was very small, too. Sadly, he can’t be freed, and obviously killing the animal is totally unacceptable (some people have said he should be put down) – so he has to live out his days miserably. Too bad there isn’t some whale sanctuary where he could go to. Agreed… the press is making much hay of the two previous deaths that surround this whale. What are people expecting they’ll do — have him euthanized? Not likely. And certainly not justified. A person’s death, while tragic, is as you say a reminder that we keep animals in captivity at our own risk. I am guessing that, just as we chose to forever compromise this whale’s freedom and quality of life, we accept that risk to his captors right along with it. I wonder if we couldn’t start studying how to better prepare such whales for release back into the wild? Surely if his captivity had so much scientific value we’d have sorted that out by now.. I totally agree with you, Keira-Anne. I think the best thing that we can do as humans and consumers is refuse to patronize the aquariums, zoos, etc. And to encourange our friends and family to do the same. I LOVE orcas and I live that her family said they don’t want the animal killed. Rightly so, it IS a wild animal, and you can’t get mad at it. I have always had strong opinions on keeping cetaceans in captivity. As a child, I noticed that killer whales kept in tanks at the Vancouver Aquarium, had their dorsal fin grossly distorted in a bent over curl. A highly visual clue that harm was being done by being kept in an unnatural environment. I strongly urge everyone to get a copy of, watch and share the movie, ‘The Cove’. Although it is a movie mostly about the capture of dolphins (which are in fact, small whales) it has really opened my eyes to the capturing and displaying of all cetaceans for profit. There is huge money involved. The ‘science’ of whales in captivity has about the same amount of justification as the Japanese whaling fleets yearly captures, ‘for scientific purposes’ . BTW, ‘The Cove’ won an Oscar this year! You won’t be disappointed, please see it and share with as many people as you can.